Teaches ABC’s, 123’s and more! Fisher-Price Learn with Me Zebra Walker can help teach your little one their first words and encouraging their first steps. 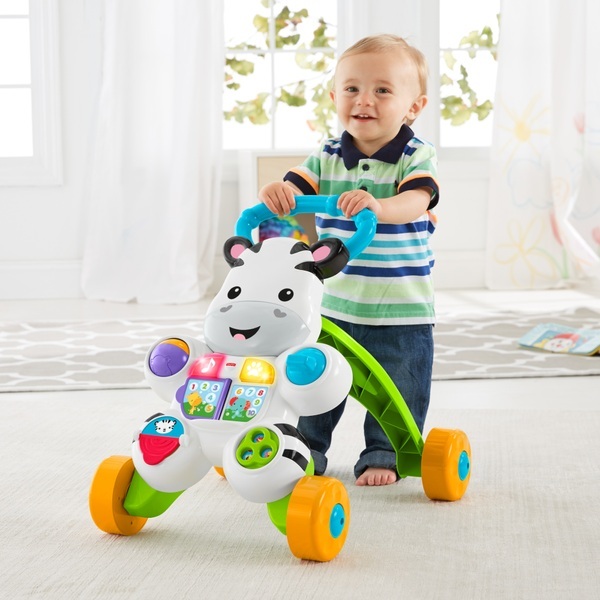 The Fisher-Price Learn with Me Zebra Walker is the kind of first friend you want for your little one! Spin, flip, roll and twist. This zebra’s full of busy, hands-on activities for sitting babies. Your baby can turn the book page or press the light-up buttons to hear all about ABC’s & 123’s through sing-along songs and phrases with new animal friends! When your baby’s learning to walk the easy-grasp handle and sturdy 4- wheel base helps steady those wobbly first steps. "Keep going!" And lots of fun phrases, music and songs invite and reward even more moving and grooving helping little ones get even steadier on their feet! EU Warning: Not suitable for children under the age of 6 months due to small parts which could cause a choking hazard.